Counter – 1 Total Count. a) Counter Range – 999999 Count Max. b) Counter Pulse – Internally from sequence software command. No. of Timers - 16 max. a) Timers Range – 00.00 to 99.99 Sec. 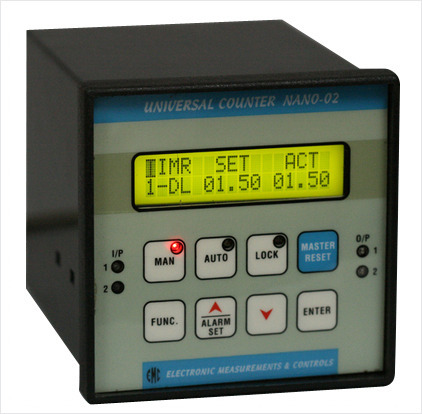 e) Counting Mode of Timers – Down counting Type Std. Up counting on Request. a) Input Voltage – 24 VDC Std. c) Min. Input pulse width – 20msec. a) Output Voltage – 24VDC Std. b) Output Type – Transistor Open collector O/P OR Relay Output. c) Output Current – 1Amp-Max. Sequence of Operation – As per customer provided sequence of operation. Back 2, 8 way terminals for Inputs, Outputs & power to PLC. 230 V AC ± 10%, Single phase 50 Hz. b) Overall – 96 x 96 x 120mm. Devoted to offer superior quality Monitoring & Control Instruments, Emc Automation Private Limited, was established in 1986 as a leading manufacturer, supplier and trader. Our product range includes high quality Programmable Logic Controller, Temperature Control Instruments and Digital Counters. Manufactured with modern day design, our products are highly durable, easy to install and possess longer shelf life. We utilize fine quality raw materials procured from the reliable vendors to assure flawlessness and excellently finished products.With the range of superior qualitative products, we have achieved huge client base in Plastic and Packaging industry. Our product line is engineered by our highly skilled and qualified experts.